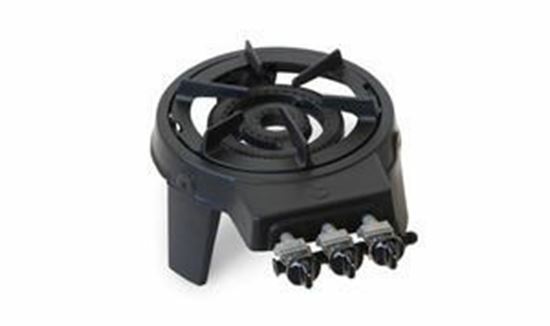 Single Burner Portable Cast Iron Stoves 63-5100. The Model 63-5100 single burner stove is a favorite with caterers, party rental stores, and restaurants equipment dealers. Its heavy wall cast construction makes this unit the ideal choice for demanding applications and its stands up to the constant movement from one location to another. It has been designed especially for really big jobs. Whether you are heating 20 quarts of soup for a film location or simmering chili or stew for large charity events, this stove gets the job done with a powerful 35,000 BTU burner.